The Power of a Hand Tool. Hand Tool – a tool held in the hand and not operated by electricity or other power. While driving to work, something on the radio sparked a memory from childhood. I have many cherished items in my home and while I try not to be materialistic, they REALLY mean something to me. Perhaps the best examples would be the pieces of furniture made by my grandfather or great grandfather. The family history of those pieces, where they lived, how they were made, is wonderful. The physical reminder of those creative men makes me proud…and happy. One smaller item that I have come to cherish is a screwdriver that my Dad gave me. It lives in the hot pink tool box along with other useful hand tools. Its first home was a small tool box Dad gave me when I moved into my first apartment. It was full of the basics for hanging pictures, putting things together, and killing spiders (you get creative when necessary). The screwdriver has 4 heads, two flat head sizes and two Phillips head sizes. The handle is yellow with the old Hechinger Co. Logo on the side. The Hechinger Co. was a hardware retail chain whose home headquarters was located in Landover, MD. They were in business from 1911-1999 and was at one time the main hardware and lumber store in Laurel, MD where I grew up (we always just called it Hechingers). It is the location where my Dad went to purchase the lumber he used to build stuff. He built lots of things when I was younger. He built bookshelves, a sandbox for my sister and I, rabbit hutches, and a microwave cart for my mom when we got our first microwave. I can remember riding on the divided lumber cart until we reached the lumber aisle, a memory that surfaces when I use my screwdriver. My Dad doesn’t really build things anymore but I always admire his creative side and the ability to do so. I assume much of that was taught to him by his father, who built many of the aforementioned treasures. Perhaps my desire to build and create started at the local Hechinger, with my Dad, riding on a lumber cart. Wine bottles are the easiest things to upcycle. 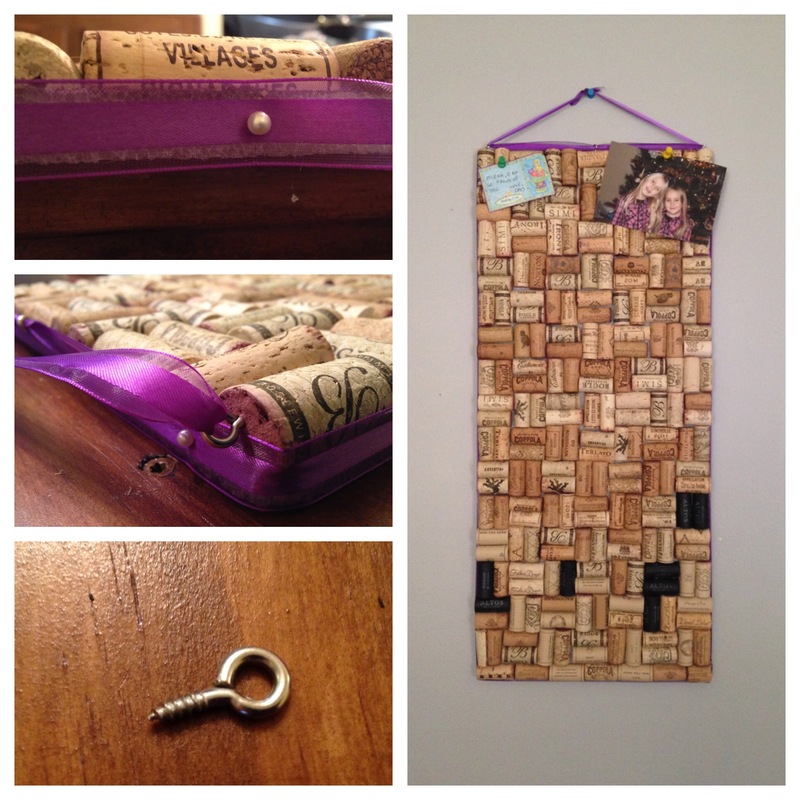 The corks, caps, and bottle can all be used to make something else once the wine is gone. Don’t drink wine? It’s pretty easy to find used bottles around from other things. Try reusing a salad dressing bottle, milk bottle, or any narrow-necked glass container. Need some unique home decor? You only need to look to your empties for some inspiration. First, start with a bottle that has a nice shape for a vase, or just one you happen to like. The narrower the bottle, the easier it will be to mount to the board. Paint Mod Podge on the bottle starting from the bottom and tightly wrap the cord/twine around the bottle, painting more as needed. Mod Podge is basically glue and although it will dry clear, you will be able to see it on the glass in any open space. Once you have wrapped all the twine you like, let it dry for a while to set. Add your sticker or embellishment to the bottle where you determine the front to be. Second, cut your threaded rod to the length needed to keep the bottle hanging straight from the board. It needs to be long enough to screw into the split ring hanger and the ceiling plate, holding the bottle away from the board. You can cut a length of it with a hacksaw or a cutting wheel on your Dremel tool (that is what I did). Third, cut a board from a pallet that has a unique and interesting shape to be several inches longer than your bottle on either end. You can stain it, paint it, or leave it bare. Use wood screws to attach the ceiling plate to the board. Attach the ring hanger to the bottle neck and then thread it onto the rod. Last, attach a wall hanger (like a picture frame hanger) to the back of the piece of wood to hang it with and you’re done! Simple, unique home decor. Similar to the wreath, I cut wine corks in half with a sharp knife and used hot glue (multi temp) to attach them to a piece of Styrofoam. You can cut Styrofoam into any shape that will work for you. The glue holds well to the foam, better than other backings I have found. Once the foam was completely covered, we needed to figure out how to hang it on the wall. I pinned ribbon around the edges to hide the foam and add some color. The photos are a little misleading in that you CAN see some of the foam through the corks. I think this is because I didn’t take the time to cut them and make them fit tightly. You can certainly do a better job on yours! My daughter will just be covering the gaps with stuff. I used eye screws at the top, screwed into the corks. Then the same ribbon was threaded through to make a hanger. Where do you create? What type of space inspires you? Perhaps you need clean lines and lack of clutter to find that creative zone. Or, maybe you need the chaos of beloved items surrounding you. Each creative person needs some kind of space to work in. Writers, painters, sculptors, jewelry artists, film makers, and designers all do their “thing” someplace different. What is that space for you? I’ll share mine, and there are several, with you. Please feel free to comment with your favorite space to create, even if it’s the kitchen table. One of my typical creative messes. 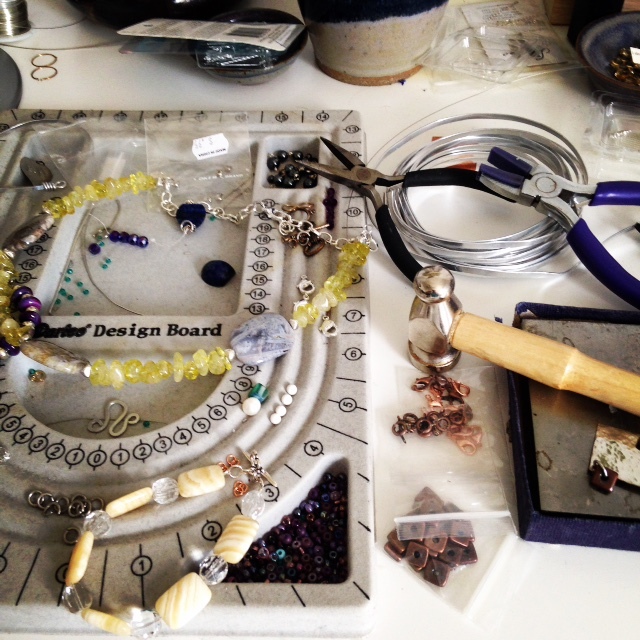 I love to be surrounded by jewelry findings, beads, and tools. When we moved into our new house, I was very excited about having space for a craft room. Prior to the new house, I used any space I could and usually had to clean up after myself in order to use the space for it’s intended purpose. I now have a space where I can leave things out, all over the desk, and not have to put them away. Having a chance to see the beads and findings, ribbon, tools, ect. offers more potential for creativity than if they are all packed away neatly. This goes against everything in me though. I like to have things put away, in their place, neat and tidy. Except crafts. We have a lovely back deck that is covered. This is the second space I use and love. In the spring and summer, there are beautiful flowers outside in both our yard and the neighbors yard. It’s a great place to be creative. I often draw, read, write, paint, and make jewelry outside. Natural light is very important to creativity. I asked my friend Karen, who is an awesome creative person, where she preferred to create. “Places with the most natural light possible”, she said. My favorite creative spot outside. Another wonderful thing about our new house is the garage. I have never had a garage before. My parents home does not have one so this joy is new for me! We don’t use our garage for the cars currently so there is plenty of space to set up projects. I am not a woodworker, but I do love trying new things and tools are no exception. My friend Jason from East Coast Upcyclers recently shared a table saw with me. I am excited to (carefully and with all safety attire) try it out. A creative space can be anywhere that makes you feel inspired, comfortable, and ready to make something beautiful! When my sister moved into her current home a few years ago, I went over to help her with some renovation jobs before they moved everything in. One of the things I got to do was rip out very ugly carpet and remove staples galore from the wood floors underneath. As we were working on this, she commented on how she hated the old chandelier in the dining room. Thinking back on it now, I should have asked for the entire chandelier, painted it, and sold it again. They are a bit trendy now. Instead I asked only for the crystals from it. They were glass, not plastic as new ones are and they were pretty. All they needed was a bit of cleaning. 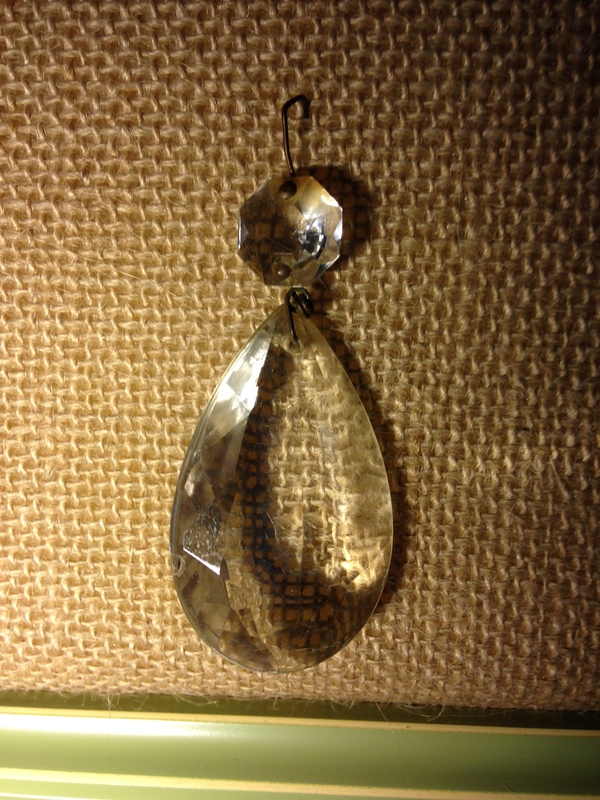 Each crystal dangle consists of two pieces held together with wire headpins. The larger piece is what was used for this necklace. First, the crystals needed to be taken apart and cleaned. I used soap and water to clean them. They had a little bit of rust from the wire and a lot of dust from the years. They clean up pretty easily though. Then I got to work decorating the crystal to add it to a chain. 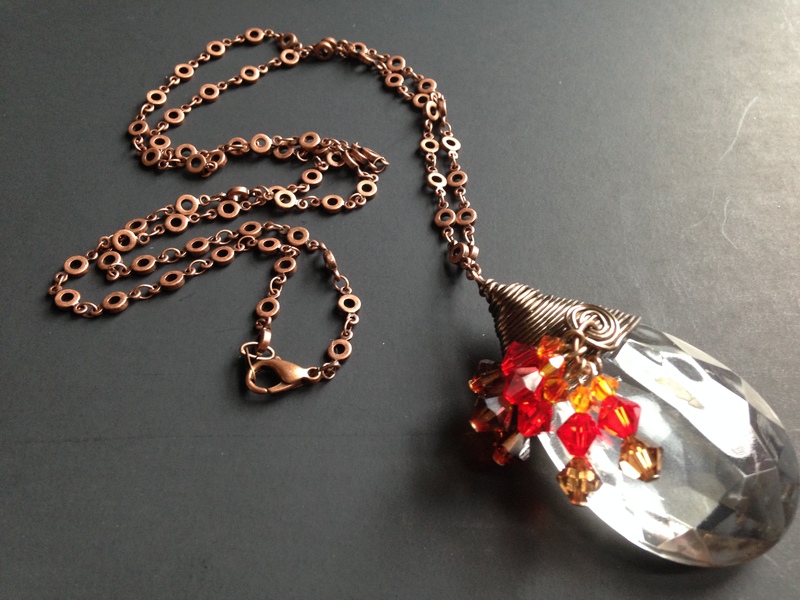 In this case I used a bronze/copper looking chain and wire wrap. I added wire through the existing hole, made a loop for hanging and then tightly wrapped the wire around the crystal from the top towards the middle. There is no specific place to stop wrapping it. When I was happy with where it ended, I formed a small spiral with the wire to finish the wrap. 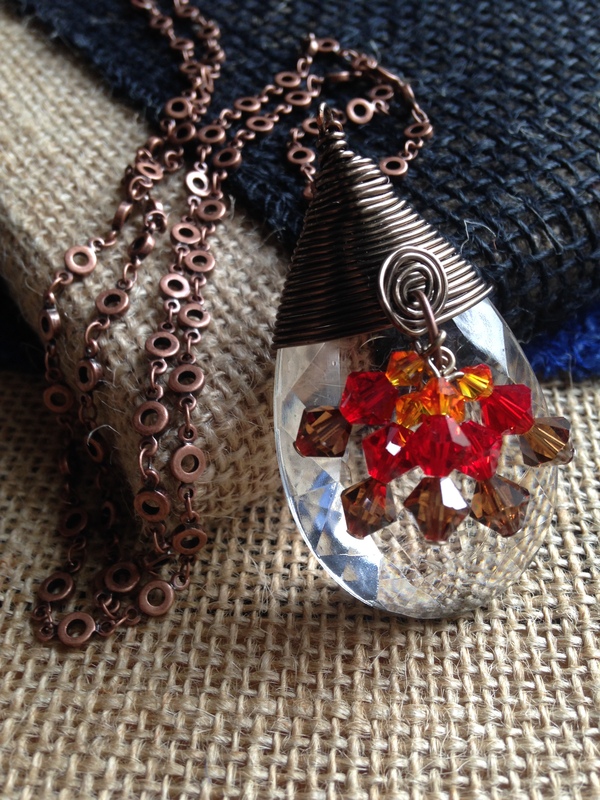 I then added the five dangles of red, orange, and brown Swarovski crystals to a copper jump ring and attached it to the spiral. Finally I added 28″ of chain. The size of the crystal made me think it should be long but it doesn’t have to be. There is a lot of potential for other colors and chain options. I have also used some of these crystals to make suncatcher ornaments for my coworkers. Each had different colored dangles. Finished necklace with colored dangles. Yard sticks. Three feet of give away advertising space. 36 inches of space to let people know where to shop for a new car, a bank loan, or much needed hardware. 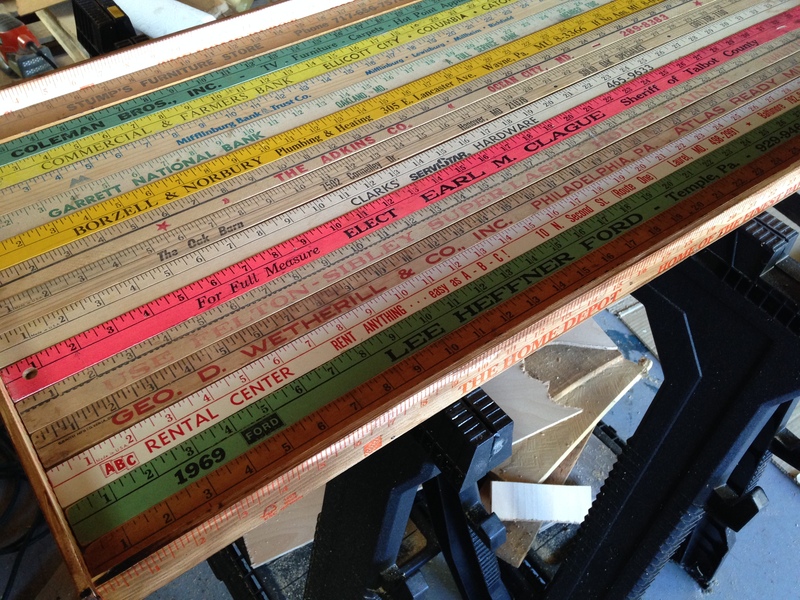 Before snazzy new ways of measuring, such as the metal measuring tape came along, these sticks of wood were the go-to for figuring out how long something was. Now, they mostly end up in the corners of pantry closets or hanging on a hook in the garage. I thought it would surely be easy to collect enough of these old, unused sticks for free to construct a craft project. Boy was I wrong! Apparently, creating furniture and art out of yardsticks is trendy right now. I had a terrible time finding them and when I came across any for sale in antique stores or flea markets, they were anywhere from $3-$15 a piece. What?! I was on a roll after my Dad found 5 of them at his house and did NOT charge me for them. My goal was to make a yardstick tray, the full length of 36 inches by whatever height the number of sticks I found would equal. The tray was to be used for our ottoman, which is soft and difficult to put a drink on. Over my spring break, I decided to get started. Below are the materials I used. thin piece of plywood large enough to be the base for all of the yardsticks. First, I laid out the sticks to determine which side I wanted to show. Some of them had the same info on both sides, some did not, and some were damaged on one side. I preferred the sides that had the city and State of the business. I also looked for the sides with the most character. I found that not all yardsticks are the same depth. So when they are laid flat next to each other, some of them stick up higher than others. This is an issue if you want to put a drink on the tray. I ended up having to put the thicker ones at each end. Gluing the sticks to the plywood. Once the base of the tray is finished and dry, the edges need to be applied. I chose to use additional yard sticks to trim it out. You could use thin wood or a large picture frame as well. If you want to add hardware, such as handles, you will want to have wooden ends wide enough to attach them. 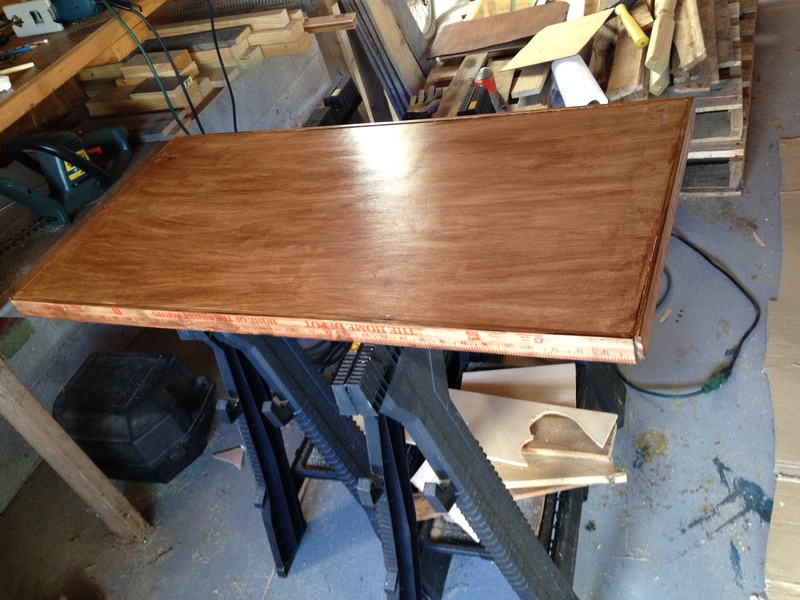 Once the sides are attached, you may want to stain the sides and bottom of the tray if you didn’t do that to begin with. I am still considering putting a large piece of glass on the top to make it more table top like, however, that will also make it very heavy. 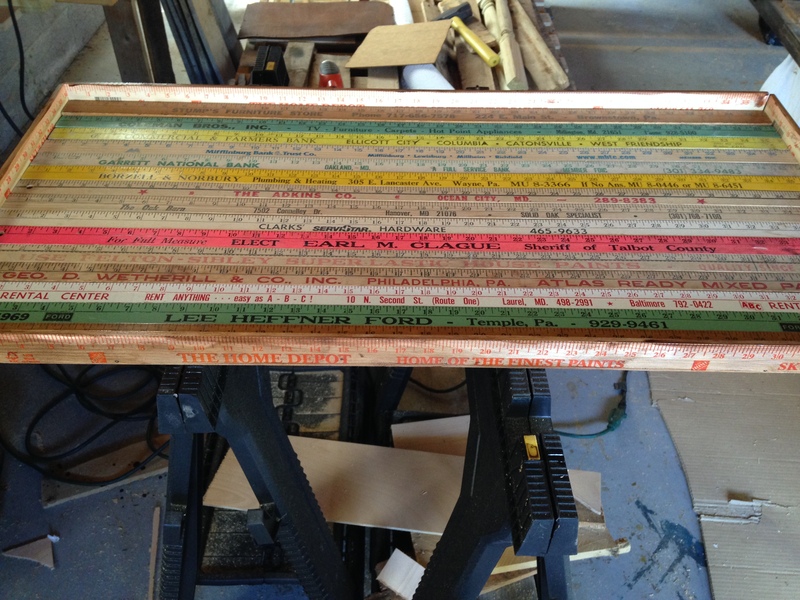 If you have made one of these, or anything else using yardsticks, I would love to hear about your project and how it turned out for you. Wine corks are so easy to come by. I had my friends and my Aunt save and send me their used corks but you can also ask restaurants to save them for you. I have made keychains, ornaments, and wreaths out corks and I thought I would post the latest wreath I made here. This one was a request from my Mother In Law. She loved it. Wreath base and corks all ready to go. I cut the corks in half length wise with a sharp paring knife. I used all purpose hot glue to attach the corks to the wreath base. Cover the base with corks in an interesting pattern. Be sure to show the best, most interesting corks near the top. Add ribbon and a bow to finish it off. You can screw in an eye hook as a hanger as well. I love to DIY. In retrospect, I should have learned a trade like carpentry and worked with my hands. I always think "I can do that", even when I probably shouldn't try. I love crafting, making jewelry, being outside, my dogs, and house projects. I do NOT like spiders. They are terrorists.